Title: Street Smarts. Adventures on the road and in markets. A few words for readers unfamiliar with the name Jim Rogers: During the 1980s, he and George Soros managed the Quantum Fund that earned its investors 4,200% of profit over a decade during which the US stock market gained a mere 47%. Even at the time, Rogers invested worldwide, unlike most other US investors. It is generally safe to say that he has always had the world as a whole on his radar. Twice he entered the Guinness Book of Records, once after circling the globe on a motorcycle in two years, and a second time after touring the entire globe in a car in three years. He visited a total of 118 countries. 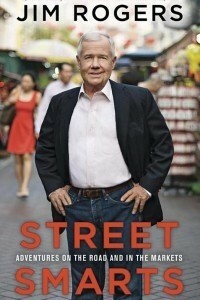 He gave an account of his travels in previous books titled Adventure Capitalist and Investment Biker. Rogers is a non-conformist. He counts among the so-called “contrarians,” meaning the sort of people who are prone to go against the grain and who tend to do things differently than the majority. It is an approach that has made him very wealthy. One thing he does is to find overrated stock and to short-sell it once its share price falls. Many years before it became the fashionable thing to do, he discovered commodities, and went on to develop the first commodity index to be taken serious, which now serves as basis for a number of investment funds. His latest book now brings personal reminiscences together with reflections on investment philosophy and analyses of economic and political prospects on the one hand and the United States on the other hand. To put it in a nutshell: Rogers is extremely sceptical about the outlook for the United States, and extremely optimistic about the outlook for Asia. In fact, he took personal consequences and moved from New York to Singapore in 2007. Having become a first-time dad at age 60, he wanted his children to grow up in the place where they would have the brightest prospects: In his eyes, this place is definitely Asia, and not the United States. What makes him believe that the United States is past its prime? Well, the country is heavily in debt, and it is impossible to say how it will get out of the debt trap. According to Rogers, the United States has embarked on a trip that Japan has been on since the 1980s. The Fed and the US Government, he argues, lacked the courage to let the forces of “creative destruction” (Schumpeter) do their work, undertaking everything to save the banks instead, which is what happened in Japan at the time. The thunderstorm that would have cleared the air never came. Rogers suggests unequivocally: letting some banks go bankrupt would have been the best thing to do. He freely admits that this would certainly have precipitated major upheavals. Yet these would clearly have been a lesser evil than the kind of policy the central banks pursued instead: ceaselessly printing new fiat money, devaluing the dollar in the process, and invoking the spectre of inflation. His advice concerning the euro crisis, by the way, is the same: Leave it to the market. Let a country like Greece go belly up. It simply makes no sense to go against the forces of the market. As Rogers points out, there are many historic precedents for such political attempts, but in the long run they have failed just as often, because the market is ultimately stronger than the good intentions of lawmakers. What compounds the situation for the United States in his eyes is a slew of other issues on top of the economic and financial trouble. The country’s educational system is in a disastrous state, he finds. Also, there is a general and permanent sense of panic over the risk of getting sued over some liability issue. Every US physician needs to ponder the risk of being sued before he or she can administer anything at all. This causes costs to soar, and with it the level of inefficiency. Rogers also deplores the fact the political liberties have been increasingly curbed in the United States. He believes that the terrorist attacks of September 11 triggered the wrong kind of response, and that the very things the terrorists targeted are being abandoned through the massive restrictions on political liberties and through the installation of cover-all surveillance. Moreover, he feels that the United States has kept overplaying its hand militarily – as there is simply no way to financially sustain its global military presence and the wars it leads to. Long-term, the United States according to Rogers is going down the same road as other world empires before them – from the Roman Empire to the British Empire – and will lose its dominant position. By contrast, his outlook for Asia is positive without reservation. He is convinced that the 21st century will be the Asian century, and a century focused on commodities. That said, he takes a dim view of the so-called BRIC investment philosophy. He does not envision a particularly rosy future for Brazil, nor for India or Russia. China, however, has a system far superior to that of the United States, notwithstanding the massive problems it continues to wrestle with. He argues that China practices as purer form of capitalism than the US, and that the State of California is actually more socialist than China. Rogers also believes that North Korea will sooner or later follow China’s example, and initiate market economy reforms. The market economy reforms will eventually bring more political freedom, a multi-party system, and democratic reform. Rogers loves to provoke. When he discusses the future prospects of North Korea while painting the bleakest picture of America’s future, he is bound to spark controversy. Non-conformist as he may be, though, Rogers is absolutely right about quite a number of things. This goes for his criticism of ever more restrictive regulations, his diatribe against the policy of “cheap money,” the case he makes for the free play of market forces and against interventionism, and certainly his favourable diagnosis for Asia. I for one share his scepticism concerning many misguided developments in the United States, even if I have more faith in its strength as a nation. The forces of liberty are in any case stronger in the United States than they are in Germany or France. A policy like that of Hollande in France is inconceivable in the USA. While Obama and his ilk may be trying to “Europeanise” America, they meet with formidable resistance. Unlike Europe, the United States reports positive demographic growth. Also, the United States is rich in natural resources, and is in a position to exploit these resources by fielding advanced technology. Rogers has never minced his words and never been a man of subtle differentiation. The book is meant as a rallying cry. And it is definitely a book worth reading because it is thought-provoking even if it dramatised and exaggerates certain things. I would also like to add that Rogers’ analyses are far superior to those offered by his former partner George Soros. While Soros, who sees himself as an unappreciated philosopher, vies for the favour of the intellectual left by fielding primitive anti-capitalist hypotheses, Roger is bold enough to antagonise the spirit of our times. R.Z.